Great White Shark for Kids: Learn about these terrifying fish. Great white sharks are the largest and most fierce predators in the ocean. The scientific name for this fish is the Carcharodon carcharias. The name comes from two Greek words meaning "sharp" and "tooth". They are giant fish that can grow to 20 feet long and 4000 pounds. Fully grown, Great White Sharks are at the top of the ocean's food chain. The only animals that will attack a great white shark are orca whales and other great white sharks. Great whites also have powerful jaws filled with lots of long teeth up to 2 1/2 inches long. Great whites have a white underbelly, but are darker on top. This gives them some camouflage from prey where they tend to blend in with the dark ocean floor when viewed from above and with the bright surface when viewed from below. Sharks are carnivores that eat other animals. 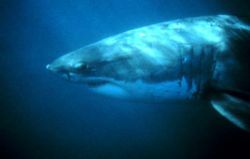 Younger and smaller great white sharks mostly eat other fish like tuna. However, fully grown great white sharks like to prey on sea mammals like sea lions and seals. They have even been known to take down whales, dolphins, and seabirds. Sharks don't chew their food, but will tear off big chunks of meat and swallow them whole. 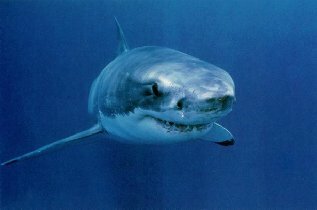 Great white sharks are found throughout the world's oceans generally in cool waters close to the coast. They live in areas where the water temperature stays between 54 and 75 degrees F. They are often found near Japan, Australia, South Africa, and both coasts of the United States. What are baby great whites called? A baby great white shark is called a pup. Pups are fairly large, 5 feet long, when they are born. The mothers don't take care of the pups when they are born and sometimes even try to eat them. One reason sharks, including great whites, are such good hunters is because they have excellent senses including smell, hearing, and sight. They also have a sensitive electro-receptive sense called the Ampullae of Lorenzini. Their sense of smell is so good that they can detect blood in the water from up to three miles away. They can roll their eyes back into their head to protect them.